I'm entering this into the Memory Box #4 challenge which is " terrific trees." I'm also taking this over to Pixie's Snippets Playground #194. Thanks for stopping by and do have yourself a wonderful day! Stunning card with just the red and white. Fantastic fussy cutting on that tiny bird but he looks great on the tree. So lovely! The red and white is so striking, Carol. Love the addition of that sweet little birdie! This is a beautiful tree die. I think it was a terrific idea to make that pocket the way you did. That cute little bird picked the prettiest tree to fly to, that's for sure. Enjoy your Sunday. Wow wow wow!! You have made a treasure of elegance!! Love all the details and the white to white is just wonderful with a touch of red! What a beautiful way to use this die, Carol! I love all that white with the red and the tiny red bird perched in the branches is adorable! This is GORGEOUS! What a pretty diecut and it looks marvelous in red and white! That tree looks wonderful, and a very useful die to own. 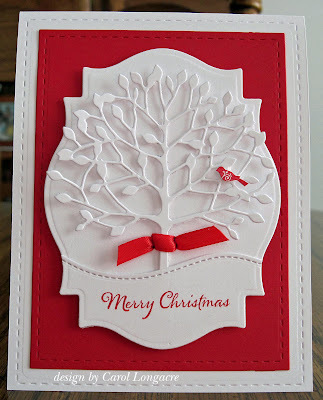 A fabulous card, the tree fits perfectly on SB label mat and I love the way you made the little pocket. Your fussy cutting of the tiny bird is very impressive, and he looks so sweet perched in the tree. Such an elegant and pretty Christmas card! Really like your design. I was given a die cut of one of those trees and I still have not used it (another NBUS item...smile) You're inspiring me to get it out and make a card with it. Hope you were able to enjoy our beautiful weather that we had recently. Carol, that's a stunner of a card. Red and white perfection! A gorgeous Christmas card Carol, such an elegant design. I love that you framed this tree so perfectly against the white and red! The crisp and clean feel of this card is gorgeous! What classy card! This is just wonderful in so many ways. You rock the red and white! What a stunning card. I love the white on white and the pop of red. Totally stunning! Way too go! Just seen your card on the Playground - wow this is just so perfect. I love it. This is a GORGEOUS card! Thank you for joining the Memory Box Challenge. Stunningly beautiful card! Love it! Thanks for sharing! Hi there. I wanted to thank you so much for participating in our Memory Box September challenge. Beautiful design and choice of color to really create a dynamic Christmas card.